The brewery was located beside the railway to the west of Crowle Wharf. It had its own railway siding. The site is now occupied by the food processing company Canley Packers. The Brewery was constructed in 1878. 14 March 1882 – Partnership between Thomas Dymond, George Robinson, the younger, and Thomas Nutt dissolved as Thomas Nutt has retired. Thomas Dymond and George Robinson to take over. 13 October 1883 – Thomas Dymond dissolved his partnership with George Robinson. In preparation for the Auction in June a valuation of the Brewery and its other properties was carried out by Hebblethwaite & Son, Land Agents of Hull. The paper relating to this valuation are now in the Hull History Centre and can be seen here; This includes an estimate of the costs for building the Brewery. All the pubs with the exception of the Ellers Tavern were bought between 1876 and 1878. The original partnership of three had put in shares of £7000 each. However in 1882 Thomas Dymond purchased Thomas Nutt’s share at 50/- in the £ – ie he paid £3,500. The valuer notes that Dymonds share was £10,00 to Robinson’s £7000. 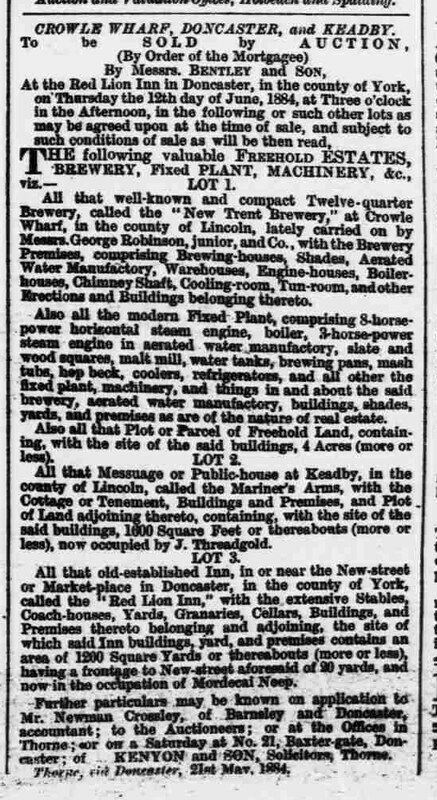 12 Jun 1884 – Brewery Auctioned, by order of the Mortgagee, along with the Mariner’s Arms in Keadby and the Red Lion Inn in Doncaster. Report in the Sheffield Independent stated that the Brewery and Mariner’s Arms were withdrawn without a bid whereas the Red Lion was withdrawn at £2000. 28 August 1886 – Partnership between Thomas Dymond, of Barnsley, and George Robinson, the younger, dissolved. 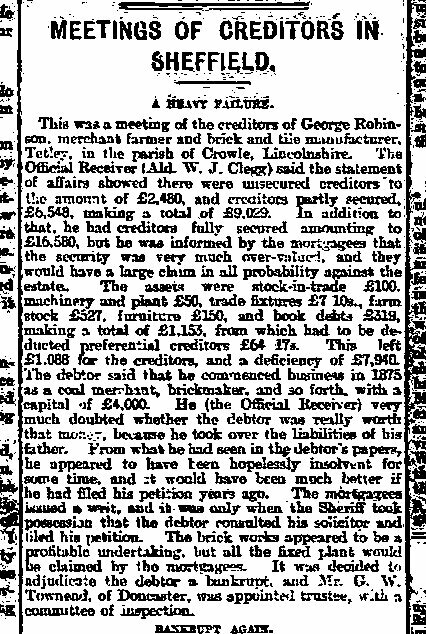 Had been operating as George Robinson Junior and company. Thomas Dymond to continue under the name New Trent Brewery. 1891 – Thomas Dymond Purchased the New Trent Inn for £1400. Additionally he bought the two adjoining villas for Joseph Franks. 1898 – Thomas Dymond died, after which the brewery was run by his executors until 1900 when it was taken over by John Dymond, his son. New Tent Brewery Company Ltd registered in 1911 to acquire the business carried on by John Dymond. Closed for financial reasons in 1915. 1916 the Barnsley Brewery Company took over the lease of the New Trent Brewery Company of Crowle and their 36 licensed houses and in 1918, took full control of the Company. 1918 Property commandeered as a “Flax Factory” by the Ministry of Supply. However by 1925 the assets of Flax Cultivation, Ltd were being sold off including the site at Crowle which was sold to Mr R Thomas. 1951 – New Trent Brewery in administration – I suspect this was in order to wind the company up.